Live Your Poem...: Celebrating Life with Poems about "Now"
Celebrating Life with Poems about "Now"
Hello and Happy Poetry Friday! Be sure to visit Jone at Deowriter for Roundup. Here it's the eve of AGNES' entry to the world - for those of you who are interested, I am still taking octopus poems and art! Thanks to all of you, Octopus Month is going to be lots of fun. And... it still feels like summer -- esp. 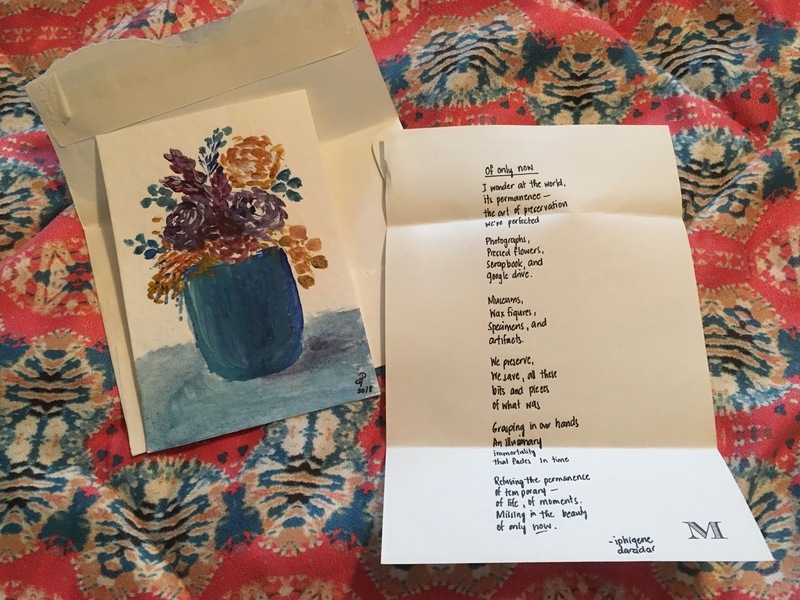 when I received in the mail a late Summer Poem Swap from Iphigene, who joins us from the Philippines! Iphigene wrote this poem after reading something on my blog: "All in nature is temporary." it doesn't discriminate; nows go on and on. Now slips through your fingers like sand. Now doesn't shout or grandstand. Step after step, it faces life's marathon. Still, you can't hold Now in your hand. Now is a tiny oasis is Time's wasteland. or it can build kingdoms in everykid’s land. Now is the only moment at our command. then soon swells – too big to hold in your hand. endlessly teaching us to carry on. just don't dare try to hold it in your hand. And now... the lake is calling! :) Thank you so much for reading! Iphigene's poem calls us to contemplate new ways of looking, and I like "Refusing the permanence/of temporary -" as it contrasts with your "now" thoughts, Irene. I know "now" and live it several times a week with the grandgirls. As Imi wishes often enough, is this a "stay-at-home" day. Entering her world must be at "the only moment at our command." Love your post. oh my goodness....the synergy here is pretty incredible. I love the combination of scrapbook and google drive. Isn't that the truth, right there Iphigene? And, Irene, your poem is such a perfect response...the kingdom of now. I want to live in it. This post nourishes my soul, Irene. "Now doesn't shout or grandstand," which is why we can so easily overlook "the beauty of only now." Thank you for sharing these gorgeous poems. This morning I used the eraser mom bought when she got into coloring books in her last few years. Of all the bits of her life I saved or didn't save...an eraser. Yet holding it connected me right back to her hands, her smile, the times we colored together when I was a kid and again when I was an adult. Precious "nows" that I have collected and archived. Thanks for sharing Iphigene's and your poems--serendipity is marvelous thing! I'm looking forward to Agnes! Like you, I found The Soul of an Octopus to be inspirational. Oh, I am so ready to meet Agnes! I have struggled to live in the now, since the past year has brought a great deal of sadness, but I am learning to gingerly dip my toe back into its waters. This whole "now" thing is a challenging concept to me, for some reason. Still working on it. Two beautiful poems to remind me to enjoy NOW. Thank you for sharing them. I'm looking forward to all the octopus fun this coming month! Two poems about NOW. So gorgeous in the words and feelings. Looking forward to Agnes.